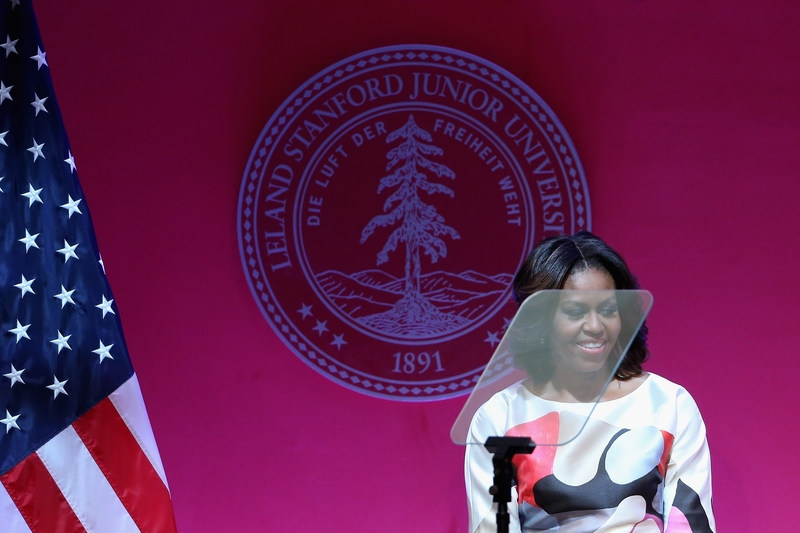 Michelle Obama speaks to several hundred Chinese and American students at the Stanford Center at Peking University in Beijing on Saturday. BEIJING – On a visit that was supposed to be nonpolitical, Michelle Obama delivered an unmistakable message to the Chinese on Saturday, saying in a speech here that freedom of speech, particularly on the Internet and in the news media, provided the foundation for a vibrant society. “Time and again, we have seen that countries are stronger and more prosperous when the voices and opinions of all their citizens can be heard,” she said. The forthright exposition of the American belief in freedom of speech came against a backdrop of broad censorship of the Internet by the Chinese government. The government polices the Internet to prevent the nation’s 500 million users from seeing anti-government sentiment, and it blocks a variety of foreign websites, including Twitter, Facebook and YouTube. The authorities compel domestic Internet sites to censor themselves. Criticism of China’s top leadership is quickly deleted and is considered to be of particular concern to the censors. Obliquely, Obama drew attention to this by making a comparison with the situation she and her husband, President Obama, face in the United States. The White House has stressed that Michelle Obama’s trip to China during the spring break of her daughters, Malia and Sasha, is intended to highlight the importance of education, foreign exchanges in particular. Obama appeared at the Stanford University complex at Peking University, where she spoke to an audience of several hundred American students studying in China and some Chinese students who had studied in the United States. The president of Peking University, Wang Enge, welcomed her, and the new U.S. ambassador to China, Max Baucus, a graduate of Stanford University in California, also spoke. On Friday, Obama visited the elite Second High School Attached to Beijing Normal University, where, along with the Chinese student body, 30 Americans study, most of whom are from private schools in the United States and pay $50,000 annually in tuition. One of the American students in the program came from the Sidwell Friends School in Washington, which Malia and Sasha attend. But in her speech, Obama said that study abroad should not be just the preserve of the rich. Others ask how useful study in a foreign country would be to their lives, Obama said. In reality, study abroad is vital for people who want to participate in a world in which countries and economies are increasingly interconnected, she said. About 200,000 Chinese students are enrolled in institutions in the United States, according to the State Department. About 20,000 American students are studying in China.